Moscow will offer Kamov Ka-52K seaborne helicopters designed for the French Mistral helicopter carriers to prospective buyers of the ships, the newspaper Kommersant wrote on Sept.2. The prospective buyer will be offered a batch of Kamov Ka-52K helicopters in addition to the ships, sources told the newspaper. 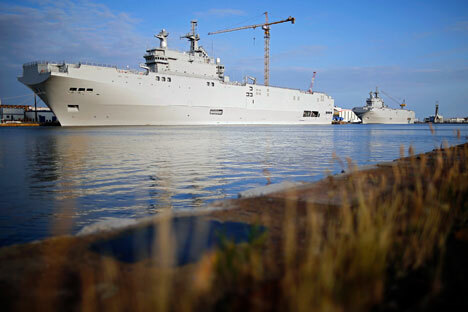 They said otherwise Russia might ban the selling of the helicopter carriers which would create a problem for France. Nearly a dozen countries, among them India, Brazil, Saudi Arabia, the United Arab Emirates, Vietnam and Egypt, are listed amongst prospective buyers, Kommersant said. There are no fundamental objections to selling the helicopter carriers to any of those countries. Rosoboronexport and France's DCNS signed a contract to build two Mistral-class helicopter carriers in June 2011. The delivery of the first helicopter carrier, the Vladivostok, to the Russian Navy was due in the middle of November 2014, but the French administration refused to honor its contractual commitments under pressure from NATO allies, primarily the United States, using the escalating tensions in eastern Ukraine as an excuse. The second carrier, the Sevastopol, was supposed to be transferred to Russia in fall 2015. In early August 2015, Russian President Vladimir Putin and his French counterpart Francois Hollande made a joint decision on the termination of the Mistral contract. On August 25, 2015, Hollande said that France has a large number of potential buyers for the Mistrals.